There is a fair number of props in the Profiles auction. All the basics are here, phasers, tricorders and the usual Geordi VISOR. (There seems to be one of these every single Profiles auction). So here are some thoughts. These are three early TNG props, all made from balsa wood. Very cool and very rare. Their rarity is balanced out by the fact that they are less desirable to most collectors than resin ones. There is a Dustbuster phaser and two static tricorders. In this market, I think they are $ 800-1,000 props. There are 4 PADDs in this auction, and represent a few major races. PADDs are pretty common, but also good looking, easily displayable props. I have a bunch and love them all. The Klingon PADD (Lot 1492) one is the least interesting Klingon PADDs I have seen. Really rather boring. I think the $ 400-600 estimate is pretty right-on. I would say $ 400 max if I was buying. The last one, which went in Auction # 40 last summer (Lot 1469), went for $ 450 and was much nicer than this one. The Romulan PADD (Lot 1493) is very cool. I have one of these and like it as I love all things Romulan. Relaly looks great in person. This one should go around $ 600. The Cardassian PADD (Lot 1494) is also a nice piece and again, probably a $ 600 item. Lot 1497 is a TNG era PADD. Simple, there are a bunch of these in existence. Don't go over $ 500 on this. The Klingon Knife, Lot 1491, is a staple of prop collecting, especially if you like Klingons. Like the Bat'Leth, it is instantly recognizable and thus very popular. I think the estimate is way low. This is a $ 1,500 item easy. 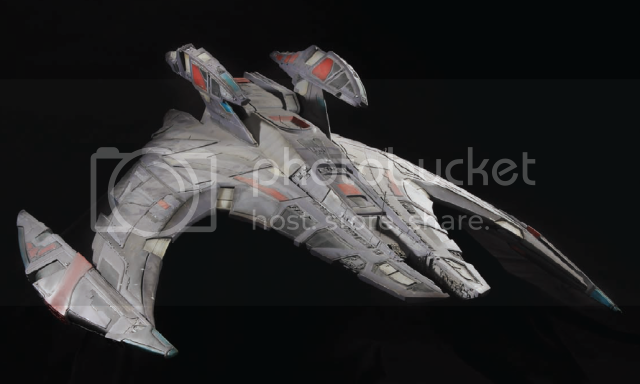 The Ferengi Triocorder is interesting as you don't see these often, but I am not sure there will be a lot of interest. The Ferengi just aren't that popular (except with Francis!) and so I will be surprised to see this break $ 1,000. The Hypospray, Lot 1496, is another important prop and I think this too goes around $ 1,000 -1,500. A lot of collectors like the staples and this one looks like a nice one, with a brass tip and a plexiglass vial. 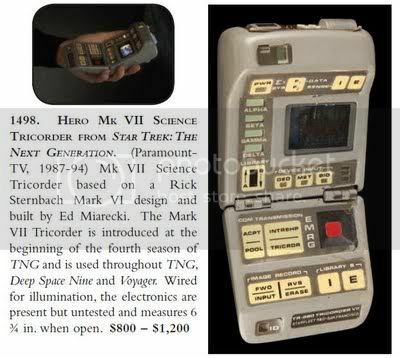 Lot # 1498 is a Mk VII Tricorder and pretty cool. This one is supposedly functional, but not working at this time. I am not sure why Profiles wouldn't have this fixed. So I would want more info on this. Working Tricorders have been going in the $ 4-5,000 range. This one might go in the $ 3,000 range, and is worth it at that level, but without verification that it works, not more. The Mk VII that went in Auction # 40 went for $ 4,250 and was much nicer and worked. Now why does Profiles have a ridiculous $ 800-1,200 estimate? That is just absurd. I wish auction houses would stop playing games with estimates. I mean I understand perfectly why you estimate low, you want people to think it is affordable, but at least be realistic. There are a few more staples of Star Trek collecting. A Romulan Disruptor pistol, a Cobrahead phaser and of course Geordi's VISOR. It amazes me how many of these come up for auction. The last one sold, in Auction # 40, went for $ 4,500. The estimate for this one is appropriately $ 4,000-6,000. Lot # 1517 is a lot fo 5 Tribbles from "Trials and Tribbleations". The last time Profiles has a group of these was in Auction # 40 (Lot 1493) and it went for $ 1,800 for 10 Tribbles, or $ 180 each. Pretty fair. This lot has 5 Tribbles so should go in the $ 900- 1,000 range. Well, that is it for now. More next week. 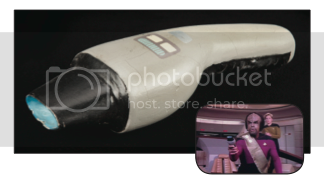 So, Profiles will have 103 Star Trek lots in their upcoming auction. But 22 of these lots are mediocre original art from Lincoln Enterprises that really aren't relevant for a prop & costume collector. Thus we have 81 items, and there is a good selection of props, costumes, original art and even a full size Enterprise Shuttelpod. 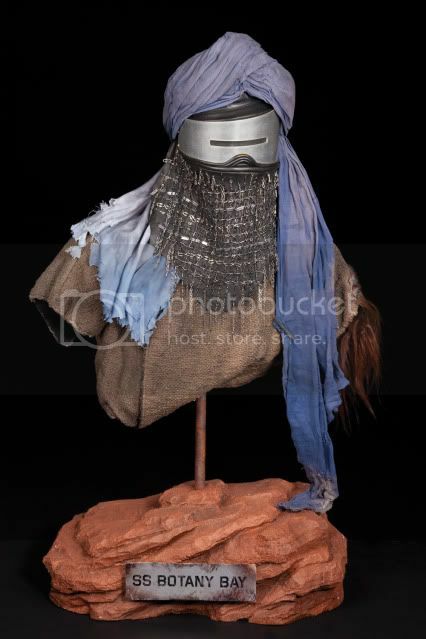 The two iconic pieces in this auction are the Khan costume head piece and the Spock robe from the beginning of Star Trek: The Motion Picture. The Khan piece has a $ 30-50,000 price, which I think is high. The Star Trek market has been flooded since 2006 and this piece sold originally in the Bob Justman auction in 2002. At that time it sold for just under $ 30,000. But at that time Star Trek costumes were much harder to get, and TNG and later costumes were selling for 2-3x what they now get. However, this is a very important piece, so I am going to be very interested to see what it gets. If it opens at $ 30,000 it might not sell. From talking to my collector friends, the general consensus seems to be that this is a $ 20-25,000 piece. Profiles of course, has a lot of buyers who have the money to drop $ 30,000 though, so it will be interesting to see. It is a beautiful display by Star Trek collector Tom Spina. 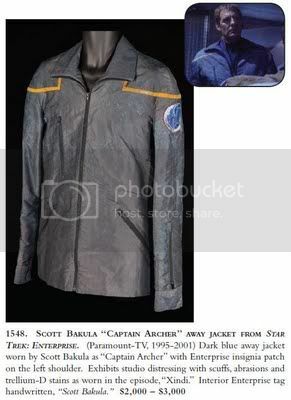 The Spock TMP costume is totally overpriced. A $ 30-40,000 bid is just not realistic. Profiles started this last auction with the overpriced "Roberta Lincoln" and "Lenore Karridian" costumes in their last auction, both of which had absurd $ 20,000 opening bids and neither of which sold. This costume is cool, but a $ 15,000 costume max. And more like $ 10,000. So how do they get $ 30,000? It is far from iconic and I will say if you spend $ 30,000 on this you are nuts. The Paley Center for Media is a permanent collection of over 45,000 television programs, 20,000 radio programs and 10,000 commercials, encompassing comedy, drama, news, game shows, children’s programs to political conventions. The shows include concerts, sporting events, science fiction, TV movies and miniseries. The following lots (Lots 1518-1531) and previous (Lots 1490-1504, 1513,1514) were part of the exhibition, “Star Trek:The Tradition Continues,” with life-size custom-made mannequins, most adorned with make-up appliances painted and dressed by Paramount, modeling the original uniforms from the Star Trek series and are being sold to benefit television and film preservation. So the above costumes were loaned by Paramount to The Paley Center and for some reason, The Paley Center is now selling them. I got called by CBS about these. I had hoped they would go into a CBS Star Trek archive (which they don't have). None the less, CBS's loss is your gain! These are nice pieces and already on mannequins. And the mannequins are pretty cool. A lot of Voyager pieces though. Not my favorite. There are also Janeway and Archer captain's costumes, both of which are distressed and have been floating around a lot lately. These should sell in the $ 3-4,000 range since good ones sell about $ 5,000. Don't go overboard on these and look for a bargain. Otherwise pass. The Captain Archer jacket is nice. You don't see a lot of these, so I like this. It should be a $ 2,500-3,500 item. I will review the props and then the artwork seperately this week, so stay tuned! So I found out who consigned the Khan piece and it is a legitimate collector who is a Propworx customer and a very nice guy. 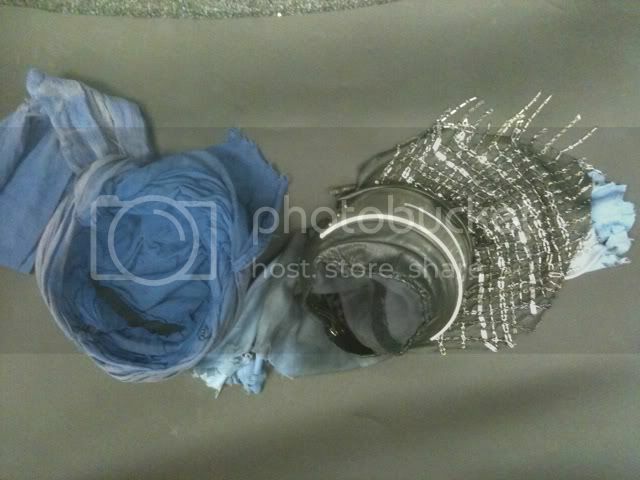 The costume was originally part of the Bob Justman collection. Why Profiles didn't state this, since this was their auction, is beyond me. "I bought the piece in the first big Profiles Star Trek auction all those years ago. I bought it along with Khans tunic, Khans glove, Khans necklace, Khan's wrist comunicator, and various wires and other jewelry. 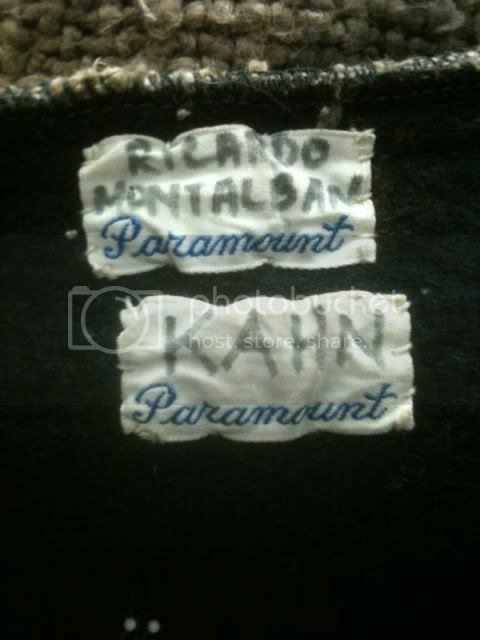 All of the costume pieces had labels saying Montalban/khan etc. The helmet has no label, never did. All the pieces came out together and were verified by various star trek experts. In addition, if you watch the movie, it is clear there was only one helmet-- in the botany bay, all the other helmets are already off, and gone from the scene. In the exterior sand storm shot, there is only one helmet that looks like this-- most don't have metal and have different shapes. After the bloated budget of the first ST movie, Khan was made on a shoe string budget, and all the making ofs describe how few version of the costumes and props there were. Very few hero anything. Additionally, looking at close up photos and screen grabs, the mesh work is very elaborate and the same-- hard to duplicate. And there is a scratch on the metal under the screen right "eye" that screen matches up. 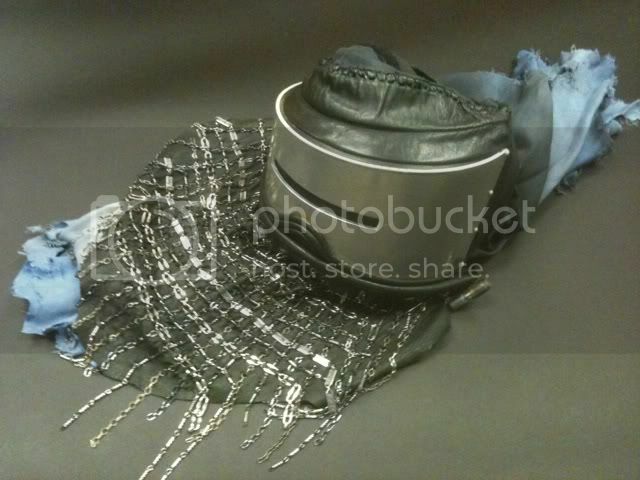 The shoulder wrap I acquired separately years later from David Jackson (Backlot Props) -- who despite its Paramount and Khan tags (which can be seen on the Profiles blog site) came in a pile of WB clothing. Who knows why. I just thought it would look great with the helmet which it does. Tom Spina built the display." Thanks to the collector for providing this information. One other note. It is ALWAYS the responsibility of the seller to prove the authenticity of an item, not the potential buyer to prove it is not. Profiles needs to provide information like this up front. The burden of proof is on the seller. Why you never trust an auction house. Don't trust, just verify! That is a change on the old "Trust, but verify" slogan of the nuclear arms treaties, but very accurate. I have said it over and over. Just because a well-known auction house is selling something, doesn't mean it is real. 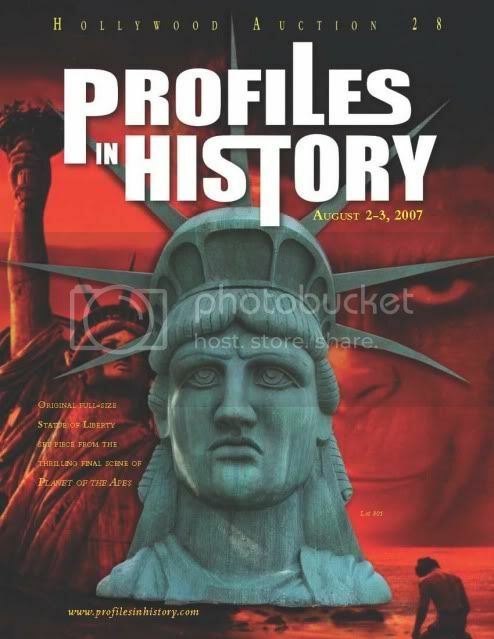 Profiles in History has attempted to sell fake items many times. The Planet of the Apes statue that was on the cover of Profiles 28th auction was a total fake and this was uncovered with minimal effort it seems. Something Profiles didn't do. Meanwhile in Auction # 37 the cover item, a supposedly rare Dracula poster, which Joe Madelena swore was real, turned out to be a fake, and one of many that some collectors had forged and were trying to pass off. Now we have the Rocky Boxing gloves. These are fake too and Sylvester Stallone's attorneys have now sent a cease and desist order to Profiles in History threatening legal action if the items are not removed. Read it on The Prop Blog here. In Star Trek we had the fake Jem Hadar Battlecruiser that I wrote about here. So what does this mean to Star Trek collectors? BUYERS BEWARE. Yeah that old saying still goes. What is the provenance of an item? Most of this information is never given and you can't simply trust an auction house that is selling thousands of items a year. You need to do your research! "Errand of Mercy" Chair found! Jason White is one of the top prop & costume collectors in the country, who I met at the Christie's Star Trek auction along with his brother. He is also a big Star Trek fan and a Star Trek Prop Forum member. 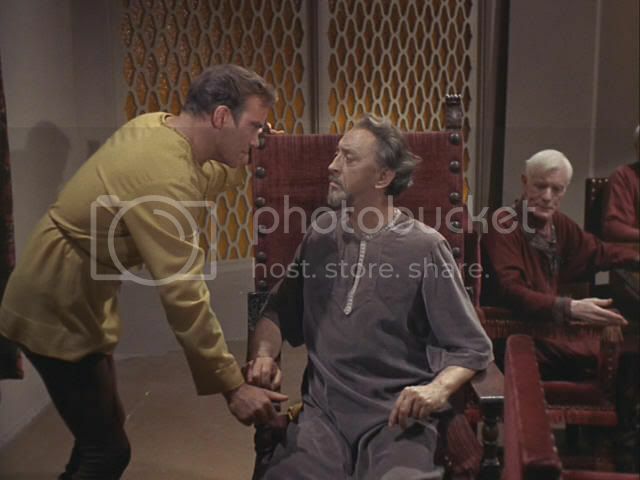 He recently acquired a piece of Star Trek history and wrote about it on the forum. I asked him to publish it here. 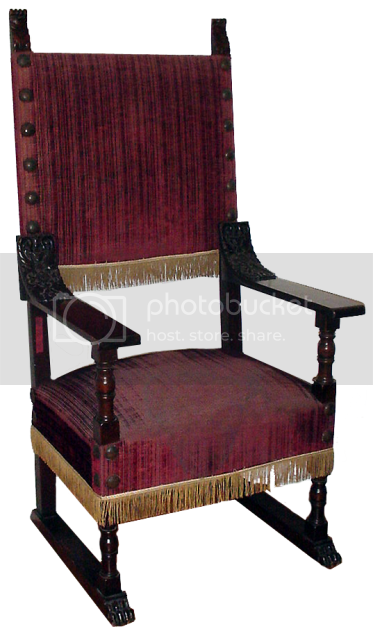 A genuine antique hand carved throne chair used in numerous historic films and TV shows, the main one I was interested in was of course Star Trek. We also found it in an 1940 Karloff/Lugosi/Lorre movie so that was exciting. Who knows where else it will show up. With numerous studio markings underneath from all the different prop houses it came from, started off in the RKO prop house, when the decline of RKO began in 1948 it was bought out by eccentric tycoon Howard Hughes, who eventually sold it to a tire company. It was soon purchased by Lucille Ball & Desi Arnaz in 1957, who made it part of their "Desilu Studios." Eventually, the RKO/Desilu property was swallowed up by its massive neighbor, Paramount Studios. This was originally sold by Paramount when they liquidated some furniture at one of the top auction houses, the auction didn't get much press as the auction house weren't allowed to use the studio's name which is why a lot of collectors missed the auction. Didn't make sense to me but bargains could be had if you did your homework. 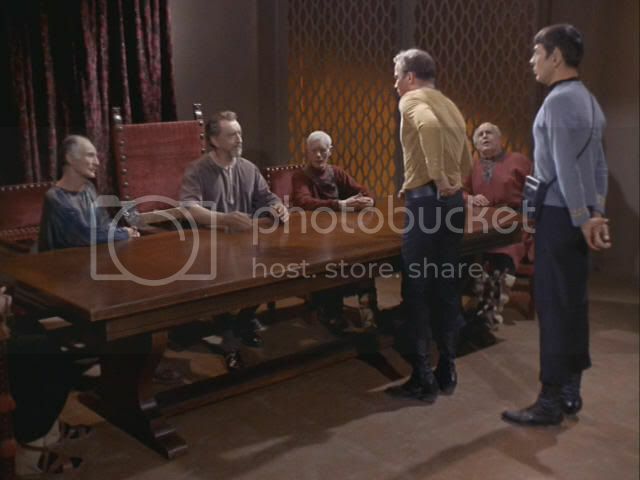 There were a lot of TOS Trek pieces sold at that auction as they used props from the old RKO prophouse. The goal is to track these treasures down. Most pieces have been scattered all over the world, mostly to antique shops as most of these items were rare one of a kind antiques. There was another matching chair sold at the time which has been screen matched to an old episode of the 50's Superman show. This chair here has been screen matched to the Trek episode. You can see 2 chairs on screen at the same time in Citizen Kane and At Sword's Point. Thanks to Jason for the great information! Profiles in History will be offering what is claimed to be the mask Ricardo Montablan wore in Star Trek II: The Wrath of Khan. The display is nice, but as always, what is the provenance on this piece? Profiles will be having a number of Star Trek items in their May Hollywood Auction 44, but so far, this is the only significant piece in the auction. More reviews of the other items they have shortly. Having seen the prototype of this at San Diego Comic Con, I can tell you this is a great deal for a high quality replica. QMX, like EFX, does great work and I highly recommend this! Got pesky Romulans lurking in the shadows? Or Klingons off the starboard bow? All you need to ward them off is this gleaming 1:1 scale, screen-accurate replica of the stunt phaser used in J.J. Abrams' Star Trek. Our replica has been cast from a first-generation master of the screen-used phaser. Its solid polystone core is precision metal-plated in several finishes – steel, gunmetal, aluminum block and chrome – to create an exact match of the actual hero phaser used in the movie. All this for just $49.95.